Our new stickers arrived today, fresh and ready for Streetfest and The Reset this weekend! As you can tell, we’ve taken inspiration from one of our favourite US skate brands (we thought this would make quite a cool limited edition sticker). Each colour is limited in numbers and won’t be re-printed … we made them specifically for this weekends activities. They didn’t turn out as big as we thought they would, but they are still rad! 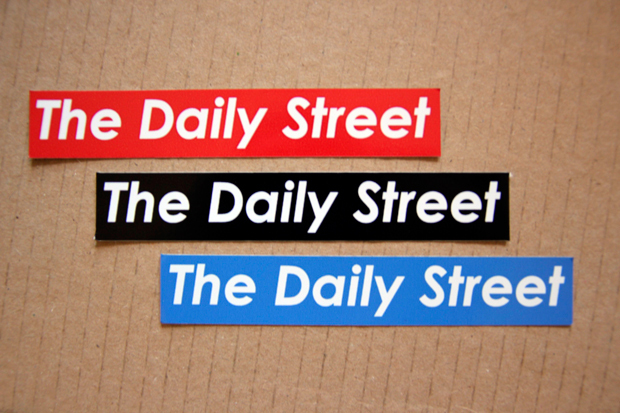 This is where it gets tricky: we’re only giving these stickers away at Streetfest and The Reset, and only one colour per event. The hyper-collectable Black stickers are not going to be available at either … more info on where to get your hands on those coming in the next few days. Cool, I’ve always wanted a Supreme sticker!